For the third year, team members from Zouk-based flexible packaging manufacturer take part in marathon’s 10-kilometer run. 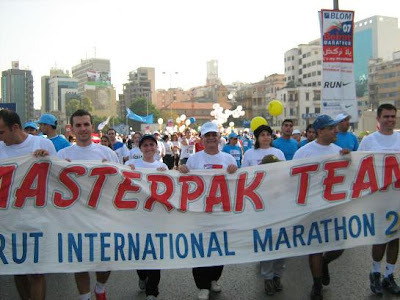 On Sunday, 18 November 2007, MASTERPAK team members and family members gathered amid clear, bright weather for the 2007 Beirut International Marathon. The start line in downtown Beirut was replete with over 15,000 people carrying banners and singing, dressed in company t-shirts, costumes or “It’s my marathon” t-shirts. Run and walk times were similar to last year, ranging from 50 minutes to 1’45”. Throughout the 10-km route, community groups entertained participants with a range of activities and performances, such as a traditional Lebanese zaffeh and dabke dance. MASTERPAK participants included Maroun Aoun, Rita Boustany, Elie Chemaly, Najah Daccache, Fady Khoury, Guy Habbaki, Claudine Merhi, Wissam Moubarak, Imad Njeim, Rany Sfeir, Maria Chemaly Njeim, Joseph Tahtouh and Tony Yaacoub. Established in 1979 in Lebanon, MASTERPAK manufactures plastic flexible packaging products and offers PE film solutions for the agricultural, construction, consumer, food and beverage, and industrial sectors. Products are destined for the local market, as well as Europe, Africa, and the Middle East. The Egyptian Organization for Standardization & Quality organizes conference and exhibition in honor of its 50th anniversary. 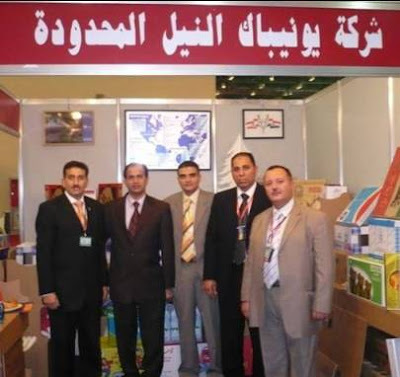 Corrugated manufacturer, Unipak Nile Ltd., exhibited its range of corrugated packaging products at the exhibition of the 2nd International Conference of “Quality and Excellence for Export” in Cairo, Egypt from 24-26 October 2007. 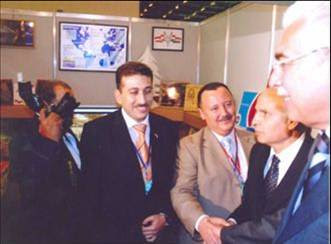 The Egyptian Organization for Standardization and Quality (EOS) organized the conference and exhibition as part of its 50-year jubilee celebration. EOS is the official body responsible for all activities related to quality and standardization in Egypt. The event was attended by international and regional representatives, as well as 100 Egyptian companies obtaining national or international quality certificates. Egyptian Prime Minister, Dr. Ahmed Mohamed Nazif, and Egyptian Minister of Trade & Industry, Dr. Rachid Mohamed Rachid, passed by the Unipak Nile stand, as they toured the exhibition. Located in 6th of October City, Unipak Nile is an ISO-certified member of the international INDEVCO Group, based in Lebanon. The plant manufactures corrugated boxes, carton, trays, point-of-purchase displays and counter stands for the agricultural, industrial, fast food and promotional sectors. Unipak Nile Ltd. converts virgin and recycled raw materials into 48,000 metric tons of corrugated regular slotted containers (RSC), die-cut boxes, and promotional displays each year. From its 38,000 m2 facility, the converter supplies agricultural and fast food industries in North Africa, the United Kingdom, and Europe. Unipak Nile was established in 1998 and ISO 9000-2000 certified by the British Standard Institute.